$11999$119 and 99 cents$70.58 / oz. Shop Thierry Mugler Alien Women's Eau de Parfum Spray Refillable (2 oz. )2 oz. 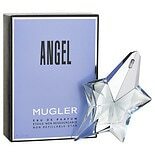 Shop Thierry Mugler Alien Eau De Parfum Spray (1 oz. )1 oz. $6899$68 and 99 cents$86.24 / oz. Shop Thierry Mugler Alien Eau de Parfum Spray for Women (1 oz. )1 oz.